When you glance out the window and see the birds are back, filling the trees with song, you know spring must be near. Since we last saw The Ravens fly past our window in December with the very strong Be I Bumble Be Or Not a few interesting ornithological developments have taken place, namely two Ravens records from 1947 officially made the charts in 1948. Write Me A Letter we’ve already thoroughly covered. Released back in October as the first official vocal harmony release under the rock banner, it heralded a new sound to join alongside the more boisterous solo singers that had laid the foundation of the form just a month earlier. The record broke into the Race Charts in early January, rising to number five eventually in a three month stint in the Top Ten. Since there was only ten spots ON those charts at this time it likely was already a legitimate hit for weeks before getting official recognition for such, so this was just a matter of a delayed reaction of sorts. More interestingly though, a month later, clearly riding the coattails of “Letter”, their release from way back in June 1947, Old Man River, also cracked the Top Ten for a single week. That was a truly brilliant piece of work, the Oscar Hammerstein written song from the hit Broadway play, Show Boat, became the perfect showcase for the group’s signature voice, Jimmy Ricks and his deep as a valley bass, which juxtaposed against the tight harmonies of the others was breathtaking. 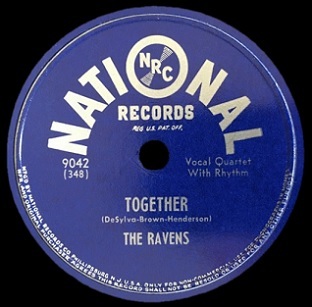 Though not officially a hit in Billboard until February, 1948, it had sold pretty well upon release (topping the Cashbox territorial charts for New York in fact for more than a month as summer wound down) and was many people’s proper introduction to The Ravens before their national chart breakthrough with Write Me A Letter, and to this day remains perhaps their signature recording to many. Clearly The Ravens were – pardon yet another fine-feathered pun – flying high in the winter of ’48 and their coops were well stocked for the long recording ban that stretched over the horizon as they’d stockpiled sides in anticipation of the shutdown. So it’s a bit odd that they chose this of all things, the decidedly moldy Together, to keep their winning streak intact, an unfortunate compromise with the pop styles they were in the process of turning on its head and replacing with something a lot more vibrant. But that just shows that nobody, not the record labels nor even the artists themselves perhaps, were quite sure what was in store for the music they were in the midst of popularizing. Succeeding in the black vocal group idiom in popular music circles to this point had been one long tightrope walk. As we’ve touched upon in the past the most popular of the groups who’d managed it to date, The Ink Spots and The Mills Brothers, had done so only by making serious pop concessions, whether by design to get airplay, or simply because they, like many others, regardless of race, actually preferred that tamer approach. But even if the latter were the case and had served those groups well over the past two decades the fact remains that there was another, rawer, style that was already being heard on the fringes of the mainstream, even before rock ‘n’ roll itself reared its unruly head. Gospel groups for one were starting to abandon their tightly mannered jubilee style of singing for a more unrestrained emotional attitude that would start to have influence in secular recordings soon, if it hadn’t already, though not in a group setting, as seen with Roy Brown’s early excursions which drew heavily from his own gospel upbringing as a child. Meanwhile the stylistic predecessors to The Ravens, a group called The Delta Rhythm Boys, with their own brilliant bass lead, Lee Gaines, (who by the way, since we won’t get to talk about this group in a rock context, performed with them for their entire phenomenal 54 year run, from 1934 to his death while on tour in 1987!) were believed to have stuck closer to their “roots” as it were, as even one of their signature songs, I Dreamed I Dwelt In Harlem played to that image, with the black social capitol of Harlem replacing Heaven in the song’s title. I’ve mentioned a few key artists who pre-dated rock but contributed to its DNA already on these pages so let’s make sure to add The Delta Rhythm Boys to that vital list. The Ravens of course weren’t immune to the conflicting demands of selling their music in a world that wasn’t always receptive to the coarser black elements, nor were they resistant to performing a wider variety of material and vocal deliveries than just what fits in the still solidifying “rock” scene. Heck, they had the Jewish song “Mahzel” in their repertoire for years! So when looking at the songs they cut as 1947 wound down you might think at first glance that it was the powers-that-be at National Records who pushed the likes of “September Song”, “I Don’t Know Why (I Love You Like I Do)” and “Once In Awhile” forcibly on the group – standards all – but it was just as likely that some, if not all, of these were what The Ravens themselves had been singing on their own – familiar songs with solid melodies and plenty of room for harmonies behind the lead. History looks down upon these contradictions when it comes to rock acts veering into pop (and I’ll be the first to admit that when it comes to taste I’ll be at the front of that particular pack when it happens), but the fact is that musicians and singers like ALL kinds of music and what sells best may define them to the public but it doesn’t always define who they are to the artists themselves. Another of those standards they tackled in the final days of 1947 was Together, a song dating way back to 1928, hardly anything that would seem connected to what was going on in the black music community of 1948 as rock was taking hold. But as they’d shown with “Old Man River” they were more than capable of turning a song inside out and adapting it to their own style and so the question would be just how well would they be able to fit this song into what else they were already making their name on? Well, it’s a decidedly mixed bag as you probably guessed. The guitar that shares space with the piano to open the proceedings gives it a hint of modernity, and of course Jimmy Ricks’s presence alone ensures that it won’t ever be archaic sounding, but this is still rather timid considering their earlier forays into more progressive material. In a way this is almost a schizophrenic recording. The first few notes on the piano are decidedly square, you almost expect Evelyn Knight to start singing “Buttons & Bows” or something. But then the electric guitar joins in and gives it a bit of a jolt. Nothing cutting edge mind you, just enough to keep you from dozing off before it gets started. Eight seconds in the group starts to harmonize and while their “Doo-doot, doo-doot-doo-doot” isn’t exactly exciting, their blend is as nice as ever and it lays a suitably tranquil harmony bed for the dramatic entrance which, if you’re familiar with The Ravens (and by this point in the winter of ’48 what rock fan isn’t? ), is sure to follow. Jimmy Ricks doesn’t disappoint when he barrels in, holding his first word “Welllllllllll” until the “l” key seems like it’s stuck before launching into the main narrative. Now it has to be said that the sentiments he’s singing can’t help but be a bit dated, having been written at a time and for a style that apparently viewed couples doing anything more than simply holding hands before they were married for a few years to be a unpardonable sin, so the G-rated romance that follows surely isn’t going to arouse anybody outside a monastery, but with that deep rolling voice he can make even the Lord’s Prayer sound slightly lecherous. When the others join Ricks briefly to deliver the de facto chorus as a group it actually comes close to elevating this past the schmaltz the entire foundation was built on. Coming out of that refrain, with Ricks digging deep to sell the next line with urgency and passion, stuttering to emphasize his emotional commitment to the sentiments you feel the tide might actually turn and this may wind up, as unlikely as it seemed at the start, to be rather soulful in the long run. Regrettably Ricks pulls back off the throttle after that, still giving off just enough heat to keep the fire from going out completely but never again tossing more logs on it to turn this into an inferno. When Maithe Marshall takes over for the dainty bridge he winds up throwing water on it and putting the smoldering embers out completely. Granted it didn’t have MUCH of a chance going in to overcome its ancient source and be transformed into something sleek for an entirely different generational mindset, but as long as they believed they could do so and strained to prove that it was possible they at least had a shot at pulling it off. Instead they threw in the towel and conceded that the record belonged to yesterday all along, which has you frustrated that they even bothered cutting it to begin with. In the last Ravens review I criticized the overuse of Ricks on one particular passage, arguing that too much of him where it wasn’t needed diluted the effect his voice had in the overall arrangement. I stand by that theory in principle. But occasionally the reverse is true, usually when it comes to their tackling substandard or unsuitable material, such as this, where Ricks’ absence for a prolonged stretch winds up robbing the songs of their one redeeming quality just when they need him the most. On Together, a song that needs all the help it could get and then some, his presence is the only thing that could theoretically save this. I guess it’s kind of like cooking where two recipes may have the same basic ingredients but each one gets measured differently. In the great Be I Bumble Bee Or Not they added a bit too much blackstrap molasses which ran the risk of slightly overpowering the other flavors. Here they use way too much vanilla when more molasses might’ve made this dish more palatable. Marshall’s exquisite high tenor voice itself isn’t the problem, the counterpoint to Ricks booming bass always provides a great contrast that serves to highlight what each does so well, but here Marshall traipses over his lines far too delicately, adding no emotion, no excitement, no electricity whatsoever. His is a pure pop delivery, which may very well have been intended hoping that it might help cross them into the broader market. But as we’ve seen before and will see throughout rock history, doing so means you risk alienating the primary rock audience who don’t listen to bland pop music for a reason! Had Marshall injected some gospel-esque fervor into this, letting go of his emotional restraint, spitting out the verses as if possessed by a love so intense that it was driving him insane, well… if he’d done that I suppose there’d be no need for Clyde McPhatter to come along in a few years and introduce it into the rock lexicon so maybe things turned out alright in the long run for rock’s ultimate evolution. But regardless Marshall’s lack of any conviction dooms this record, which was on shaky ground to begin with. It’s a shame too, because the other Ravens provide decent wordless backing to his trite delivery but since he takes center stage for a full minute of the proceedings, during which our interest not only wanes but vanishes completely, there’s little they can do to rescue it. We may wait around for Ricks to reemerge and salvage things a little but he barely gets more than a cameo from this point forward as the group as a whole, with Marshall taking a more prominent role in the mix, closes it out… “together”. As should’ve been expected the results are hackneyed and sadly predictable anytime a rock act yields to pop mediocrity. At this stage of the game we need to remember there’s always the very real likelihood that the pendulum may swing back towards what’s been long accepted as the universal standards all artists should aspire to in popular music. Bland, inoffensive and tame as it may have been, in 1948 that’s still what was expected by the industry and audiences alike and – notably – it’s still what sold the best as well. So as much as we like to envision rock as an open and hostile rebellion against that approach you can’t really expect even the best artists to simply ignore years of having had what’s “proper” drilled into them and discard that mindset altogether, especially before having more tangible evidence that their newer style was commercially potent. When they DO backtrack on their previous advances in this brave new world of rock and try instead to court favor with the establishment’s tastes you have to hope that those making up that wider market will ignore them en masse and the smaller but committed rock audience that had embraced them so fervently won’t pick up the slack for these wayward stabs at respectability, thereby forcing them back to the rougher cutting edge style that got them this far to begin with. In that way, and that way only, this could be chalked up as a constructive failure and hopefully a strong reminder that looking back rarely gets you moving forward. 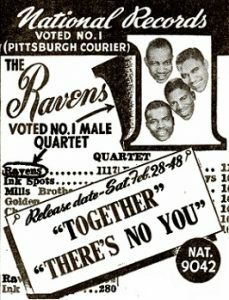 Leave a reply on "The Ravens: “Together”"